Do you need more computing power than you can get with one machine? Is it difficult to share your computer with family when everyone has own projects to work on? Imagine that you and your family members are working with own computer without stepping on each other’s feet. Thinking it’s possible just through purchasing additional equipment and hardware? IBIK company is ready to offer you ASTER – powerful software allowing users to expand their home computer usage to the next level. We understand that sometimes it seems like you need one computer for entertainment and another computer for work. That’s why IBIK offers you the most affordable and convenient way to obtain another workstation on the basis of sharing your computer. Essentially, ASTER is an advanced shared computer access program that provides you with the opportunity to share your computer and organize few workplaces for simultaneous work. 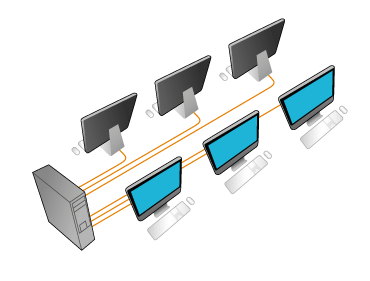 By sharing a computer, several users can work independently as if each of them had their own PC. The bottom line is that our high-quality software for sharing a computer provides home and office users with a number of advantages. ASTER allows you to start and share a computer program, simultaneously create and edit documents, watch different movie on separate screens, even play together online games and all this without system hanging. While sharing your computer and working with dual monitors, you are better equipped to organize your work more efficiently without spending a fortune. More importantly, ASTER can be successfully used not only for sharing a computer for home use, but also for equipping of computer classes, libraries, offices and Internet cafes. To share your computer and equip a second workstation, you will need just a mouse, keyboard, monitor and a second video card. With this cost-effective computer program you will definitely benefit from considerable money and space savings with the same level of computer performance.